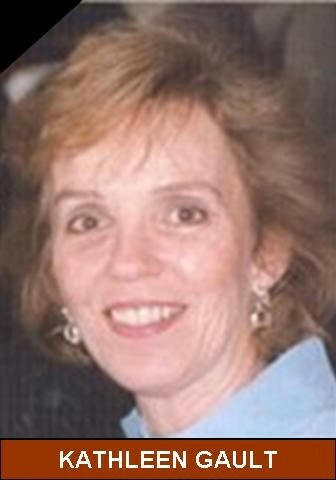 Kathleen D. Gault, 61, of Chicago, formerly of Moline, died Monday, July 3, 2006, at Northwestern Memorial Hospital, Chicago. A graveside inurnment service will be held at noon on. Saturday, July 8th at Rosedale Cemetery, Cambridge. There is no visitation. Family and friends should meet at Stackhouse-Moore Funeral Services located at 212 E. Court St. Cambridge at 11:30 a.m. to process to the cemetery. Memorials may be made to the Anti-Cruelty Society of Chicago % Carrie Reznicek; 1465 W. Grand Ave. Unit 1, Chicago, IL 60622. Kathleen was born December 23, 1944 in Moline, the daughter of Wilfred and Velma Lee Campbell Gault. She was educated in Moline Public School and graduated from Moline High School. She received her teaching degree from Western Illinois University in Macomb. Her marriage to Joseph Reznicek took place on August 20, 1966 in Moline. Kathy taught school in the Moline area and retired in 2004 from John Deere Middle School in Moline as a Spanish and ESL teacher. She received the Master Teacher Award for her work in the English as a Second Language Program. Surviving are her daughter, Carrie Reznicek, Chicago, a son Matthew Reznicek, Birmingham, AL, and a granddaughter, Emily Reznicek, Birmingham. Also surviving are her mother, Lee Campbell Hoke, Moline, and three sisters, Kim Dolleslager, Moline, Cindy Fletcher, Peoria, IL, and Judy Bourg, Corpus Christi, TX. Her father preceded her in death. Condolences may be sent to her daughter, Carrie, at the above address. My name is Bob Brown. When Kathy and I were in grade school at Jefferson Elementary in Moline, she lived about two blocks from my house in Crestwood Hills. I always liked Kathy. When I saw that she had passed, I was very surprised. What was the cause of her death? I'll always remember her as intelligent and pretty. I know this might sound superficial, but she is part of my childhood history. I hope you understand. I live in southern California and I'm a psychologist.